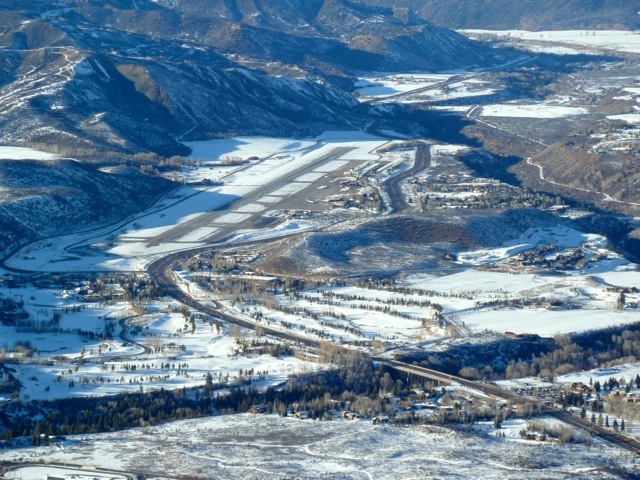 A view of the Aspen airport runway and the Hwy 82 corridor to the west of Maroon Creek. Significant redevelopment along the corridor of what is considered the gateway to Aspen is expected in the coming years, and county officials are preparing now on how that growth should be managed. A new master plan is expected to be completed by February that will help guide development at the airport, the Airport Business Center (ABC), the Buttermilk ski area, the Inn at Aspen and other properties along Highway 82. The county planning and zoning commission has been discussing the draft West of Maroon Creek Land Use Plan (WOMP) since July, and the citizen volunteers on the board are scheduled to adopt it next month. Once it is approved, county planners hope it will lead to the adoption of a Highway 82 Scenic Corridor District and then to specific changes in the county land-use code. The recommendations could influence the height and placement of new buildings at the airport, the ABC, Buttermilk and other “activity nodes” along the highway corridor. A primary goal of the WOMP is to keep development clustered and back from the highway in order to preserve views and avoid “an urbanized tunnel-like corridor” between the airport and the Maroon Creek bridge. John Howard, chair of the county planning commission, said discussions of the WOMP already have had some informal influence on other development, including the recently approved airport master plan. “They were very sensitive to what we are trying to accomplish in the WOMP and incorporated a lot of that into the airport master plan,” Howard said of airport planners. The impetus to develop a plan to guide development along the Highway 82 corridor west of Maroon Creek comes from the Aspen Area Community Plan, which was approved a year ago by the city and the county’s planning commission. The AACP more or less iced any further discussion of physical changes to the entrance to Aspen, which is the section from the roundabout to the west end of Main Street, but it specifically called for a new master plan for the area downvalley of Castle Creek. When the county planning commission started working on such a plan, one of its first decisions was to move the boundary of the planning area from Castle Creek to Maroon Creek. “The rationalization was that there really is probably not going to be anything that happens between Castle Creek and Maroon Creek over the next 10 years — what you see is what we have,” Howard said. But there is a long list of projects between Maroon Creek and the airport that are in various stages of planning and development, and most of them are outside of the city limits, which end just outside of the ABC on the north side of the highway. For example, Mountain Rescue Aspen has proposed building a new facility where Planted Earth is today. That project was recently recommended for approval by the county planning commission, but with the caveat that the main building stay within existing height limits and that a proposed training tower be nixed. Aspen Skiing Co. officials met in June 2012 with the county planning commission to review a new master plan for the Buttermilk ski area that included a large new skier-services building, but then withdrew the plan for now. A new plan to improve the internal roads at the ABC is being developed and county planners feel that a redevelopment proposal for the business center is bound to surface at some point. The city of Aspen owns the Harbert Lumber property next to Planted Earth and it bought, and annexed, the parcel with the intent of building employee housing there. And there is a county-approved plan to redevelop the airport terminal building and add a parking structure between the highway and the runway. Howard said he felt that the WOMP could influence the outcome of most of those developments. The potential changes to the corridor are well on the minds of planning commission members, who, for example, spent an hour on Tuesday evening discussing the appropriate right height for a potentially redeveloped Inn at Aspen building. The planning commission plans to discuss the draft WOMP again on Jan. 22 and Jan. 29, and potential adoption is slated for Feb. 12. Editor’s note: Aspen Journalism is collaborating with the Aspen Daily News to cover Pitkin County. The Daily News published this story on Jan. 17, 2013.